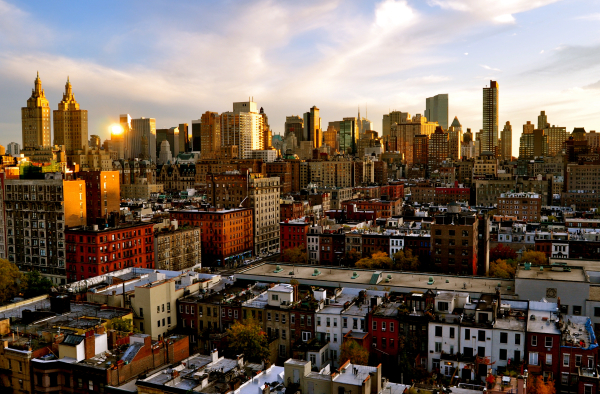 New York comes home to the Upper West Side. This storied neighborhood has made its name with peaceful residences, great schools, and utter livability in the midst of a frantic city. Visitors enjoy the area's opera, dance, music, and film at Lincoln Center and relish natural wonders at the American Museum of Natural History. Walk West 81st a few blocks, and you'll feel like a local in no time. The Upper West Side's southern boundary is Columbus Circle at the southwest corner of Central Park. The Shops at Columbus Circle are a collection of high-end stores and restaurants located inside the Time Warner Center. Among the most prestigious jazz series in the nation, Jazz at Lincoln Center holds performances at Columbus Circle as well. Take a quick jaunt through the Museum of Arts and Design (MAD), honoring artists who work in ceramics, jewelry, fabric, and other craft-related media. 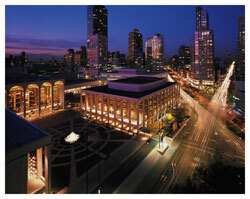 The main body of Lincoln Center is impossible to miss on Broadway and West 62nd Street. This preeminent performing arts complex boasts 46 venues, the most famous of which is the Metropolitan Opera House of the long, arched windows and Marc Chagall paintings inside. Also at Lincoln Center is the David H. Koch Theater, home to the New York City Ballet, and David Geffen Hall, furnishing the dulcet sounds of the New York Philharmonic. On the opposite side of Broadway near Lincoln Center, find discount designer fashion for all at Century 21 Department Store. Elsewhere on the Upper West Side, architecture buffs will want to stroll along Central Park West, West End Avenue, and Riverside Drive to take in the large, ornate apartment buildings. Venture down some of the cross streets, and you will find lovely brownstones and townhouses that fueled the work of local writer Nora Ephron (her 1998 film You've Got Mail helped solidify the area's homey reputation). On Central Park West and 72nd Street is the Dakota, a beautiful apartment building where some of New York’s most famous residents have lived. Its best-known tenant was John Lennon, who is immortalized across the street in Central Park's Strawberry Fields. Other Central Park sites on the west side include The Delacorte Theater, the open-air venue that stages Shakespeare in the Park. Every summer, this beloved program offers free tickets to lovers of the Bard and his work. The Dairy is the site of the Central Park Carousel and a playground for kids. Just north is Sheep Meadow, once a lawn for grazing sheep, and Belvedere Castle. Across the street from Central Park at 76th Street is the New-York Historical Society, delving into the rich history of this great city. Also in the Upper West Side are the Children's Museum of Manhattan, the American Folk Art Museum, and the American Museum of Natural History. Pack up a picnic lunch and head west to Riverside Park along the Hudson River. The promenade begins at 80th Street, wide enough for throngs of strollers, dog-walkers, and inline skaters enjoying the breeze from the Hudson River. Docked at the 79th Street Boat Basin are the houseboats, motorboats, and yachts on which a few privileged New Yorkers live and play. Every Sunday on the Upper West Side you can find Grand Bazaar NYC, the city’s largest curated market—and most distinctive! 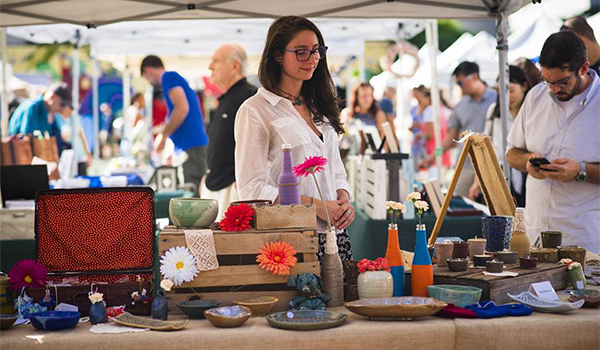 You’ll find local artists and vintage/antique dealers with one-of-a-kind fashion, crafts, collectibles, and handmade jewelry. Local vendors also sell food at this indoor/outdoor market, which runs all year long. Nearby is the glitzy restaurant-and-boutique strip along Columbus Avenue and the mix of bodegas, bars, and boutiques along Amsterdam Avenue. For fine dining, book a table as soon as possible at Boulud Sud, award-winning Chef Daniel Boulud's Mediterranean restaurant near Lincoln Center. Don't leave the Upper West Side before you buy an XL Levain Bakery cookie from their location on 74th Street off Amsterdam Avenue. For guides to neighboring areas, check out our coverage of Harlem's jazz brunches and the sites of Midtown West, including the Empire State Building. Dining on the Upper West Side: For our list of the best places to eat on the Upper West Side, click here.